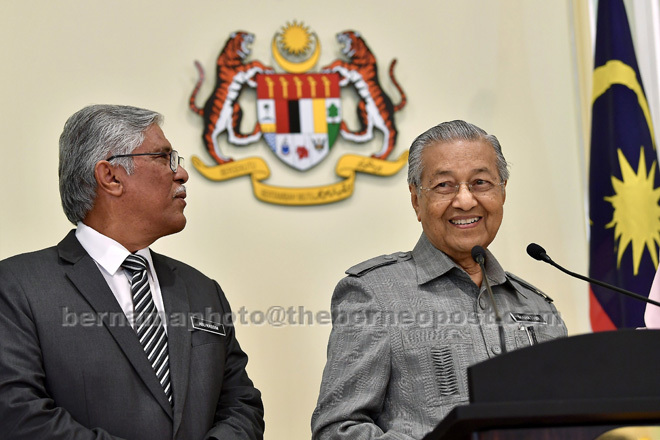 PUTRAJAYA: The government is to propose the inclusion of a provision in the Malaysian Anti-Corruption Commission (MACC) Act to show the real beneficiary owners in companies, Prime Minister Tun Dr Mahathir Mohamad said yesterday. He said this was one of the matters decided upon at a meeting of the Special Cabinet Committee on Anti-Corruption which he chaired at Perdana Putra here. Dr Mahathir said the provision would enable the MACC to identify the real owners of any interest during their investigation. “We find that some people use other people’s names, so the owners are different. We want to draft laws so that we can catch the real owners. to get the beneficiary owners,” he told reporters after the meeting. He said that though the owners use other people’s names, the evidence will be found and action taken against the real owners. Dr Mahathir said yesterday’s meeting discussed, among others, education as a means of producing a generation of integrity and of noble character in the aspect of human governance and character building. “We want to foster a culture of good living values in Malaysians and this has to start from small. “So, the Education Ministry has to emphasise this by fostering noble values in nurturing students to combat corruption,” he said. “Schools must incorporate education on culture and living values. “We will have certain slogans on prevention of corruption and show that corruption is a crime that can destroy the country,” he said. Dr Mahathir also said that the government would implement the pre-budget statement and a half-yearly review for operating and development expenditure as a measure to improve budget management. This was to ensure transparency of information on national debts and liabilities and to minimise off-budget government expenditure beginning this year, he said. “In the previous government, the off-budget mechanism contributed to financial scandals such as 1MDB and the Special Purpose Vehicle (SPV). As such, the government will strive to minimise off-budget (expenditure),” he said. Dr Mahathir also said that the meeting decided to improve the procurement process, selection criteria, consultant assessment and project monitoring. He said consultants would be required to register with the Finance Ministry and professional boards to ensure that they were really qualified and of high integrity. “The process of selecting the lead consultant can be reduced by nine processes and this saves on the execution time and gives the best benefit to the government. “The method of procuring consultants through the lead consultant will facilitate coordination with the consultants from various fields,” he said. Dr Mahathir said the government was committed to enhancing Malaysia’s involvement in the ISO/TC 309 Governance of Organisations to restore the country’s image. Malaysian certification bodies engaged in the Anti-Bribery Management Systems (ABMS) certification were required to obtain accreditation from Standards Malaysia for the purpose of control, he said. Dr Mahathir said the meeting also discussed the proposed improvement of the governance of government-owned companies and federal statutory bodies that was approved by the Cabinet at its meeting on Nov 23. “An amendment was made in relation to the MACC Integrity Screening where candidates have to get through the integrity screening before their appointment and not after. An amendment will also be made in the Minister of Finance (Incorporated) Appointed Board Member Guideline,” he said. The Special Cabinet Committee on Anti-Corruption, since its establishment six months ago, has met five times in 2018 and achieved 61 initiatives to improve the governance, integrity and anti-corruption processes and systems.